I am taking a break from food today to say express my gratitude. I just have to get it off my chest, and nearly want to shout it from the rooftops! I am thankful, every single day, for this life and what I’m creating for myself. Up until 10 months ago, I never knew life could be this satisfying and amazing. I was at a job that made me unhappy and stressed (stressed because I felt like I could never do anything good enough and often felt like I was walking on eggshells), and I was not pursuing my passions or using my energy to its greatest capacity. I’ve said this before, but getting laid off from that job was the best thing that could have happened to me. Since getting laid off, I’ve changed my attitude and perspective, surrounded myself with positive people and finally started pursuing things that mattered to me. And guess what? Opportunities fell into my lap effortlessly, and all the jobs I have now I did not apply for, but rather, they were offered to me: coaching at Recreate Fitness, making treats at Cultured Caveman, freelance writing for a former co-worker’s side business and now, doing some PR work for Jason Seib, my mentor and author of the fantastic new book, The Paleo Coach. Having people who believe in me and want ME is an awesome feeling. I am so blessed and I know it might sound sappy, but sometimes, all I can do is cry because I’m so happy. But, do you see how important it is to be pursuing the things that matter to you? Don’t settle for less…it’s not worth it and life is too short. What are you creating for yourself? Are you pursuing the things that are near and dear to your heart? If not, what’s stopping you? Don’t mind the grammatical error on here, but please know, I did not create this! 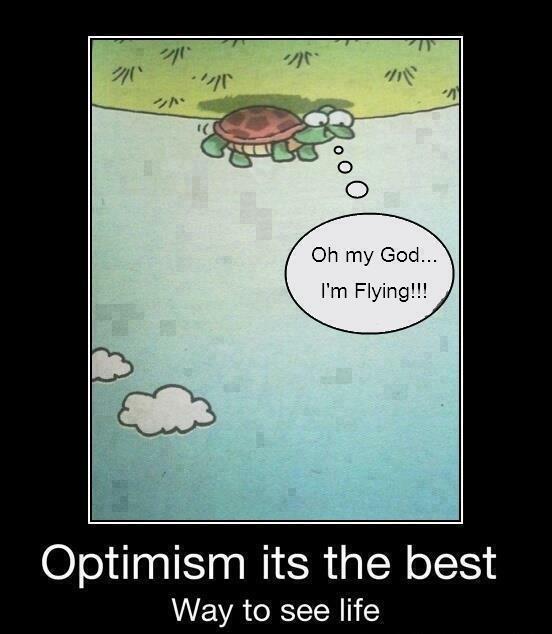 It should read: Optimism, it’s the best way to see life. Good for you, Alisa! I, too, was in a situation like you. My position was terminated and that, even though difficult at the time, was the best thing that happened to me. Fantastic post Alisa, I know how hard it is when you’re in a job you don’t like, the daily grind and having to push through! As you know obviously I love cooking but I also love working with kids and teaching, so after a few years of being out of the classroom I’m ready to step back in! Going to meet with a couple of teaching agencies here and get my feet back in the water… it’s scary since I’ve been out for a while but I feel like it’s now time to get back in! I don’t know maybe after this time of being out of the classroom I’ll go back and hate it? Or I’ll remember how much I loved being a teacher! Happy that everything is working well for you, it’s been fantastic getting to know you and your story… hopefully one day we’ll meet in real life! Thanks, Naz! Your words mean a lot 🙂 I hope things work out for you with going back to teaching, but remember, they can if you really want them to…you just need to manifest it! I know but I must admit it is scary! I know I just have to jump in with both feet! Would love for you to visit us here 🙂 Europe is just something different… you can’t compare it to anywhere else really. That’s right, you just need to trust your gut and take a leap of faith! I’ve been to Europe before, but it was over 10 years ago and I was in Germany, Switzerland and France. I’ve never been to the UK though! You are so right! Gratitude truly is what makes life worthwhile – and it takes an amazing person, like yourself, to grow and understand that. Congratulations! I appreciate that, Ashley. Thank you! So happy everything is working out so fabulously for you!